Maud Lewis (1903-1970) was born to John and Agnes Dowley on the Yarmouth and Acadian Shore of Nova Scotia. Although there is some debate about her exact birth place, recent research has revealed that Maud was born in the town of Yarmouth, NS. As a child, Maud spent most of her time alone, mostly because she felt uncomfortable about her differences around the other children. She had been born with almost no chin and was always much smaller than everyone else. However, Maud seemed to be a happy child who enjoyed the time she spent with her parents and brother. Maud's mother started her painting Christmas cards to sell and thus her career as an artist began. Her life and only experience of the world extended to an area between her birthplace in Yarmouth County and her married home in Marshalltown, Digby County. In 1935 Maud's father died and in 1937, her mother followed. As was typical at the time, her brother inherited the family home. After living with her brother for a short while she moved to Digby to live with her aunt. There she met Everett Lewis, an itinerant fish peddler, and married him shortly after in 1938. Maud spent the rest of her life living with Everett in their house in Marshalltown. The two had what has been perceived as a formidable companionship, despite any character flaws neighbors found in Everett. Because of Maud’s worsening rheumatoid arthritis, she was unable to do housework. Everett took care of the house, and Maud brought in money through her paintings. The two were a pair that Maud was proud to be a part of. The home they lived in was tiny in stature but large in character. Despite the lack of modern amenities like indoor plumbing and electricity, the house shows that Maud's life in Marshalltown was full of enjoyment through her art. Those who stopped after seeing her roadside sign, "Paintings for sale", found a quiet woman with a delightful smile. Her pleasure didn't come from the pride of having done a painting, but the creative act itself and the enjoyment others seemed to get from her work. Through newspaper and magazine articles, as well as television documentaries, Maud became well known and a reputation grew that’s still growing today. 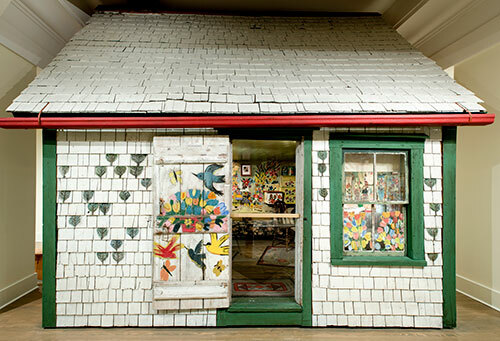 After the death of Maud Lewis in 1970, and subsequently of her husband, Everett Lewis, in 1979, the lovingly painted home began to deteriorate. In reaction, a group of concerned citizens from the Digby area started the Maud Lewis Painted House Society; their only goal was to save this valued landmark. After a number of years of fundraising, the society realized that the project was going to take more resources than they could gather. In 1984, the house was sold to the Province of Nova Scotia and turned over to the care of Art Gallery of Nova Scotia. In 1996, with funds from the federal Department of Canadian Heritage and from private individuals, the processes of conservation and restoration began. The final, fully restored house is on permanent display in Halifax at the Art Gallery of Nova Scotia. 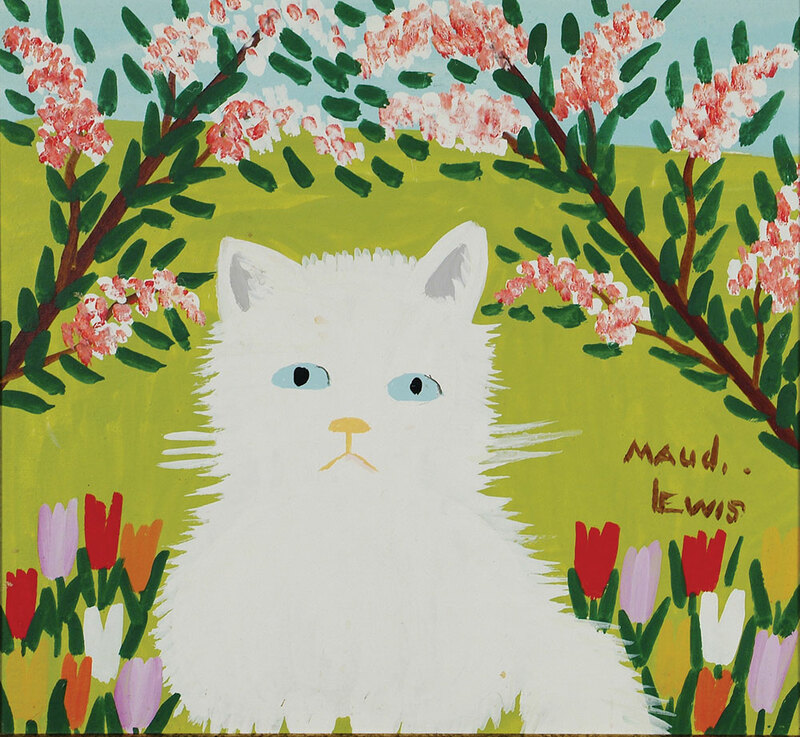 The Art Gallery of Nova Scotia has a line of Maud Lewis products available at both its locations (Halifax and Yarmouth) as well as online. 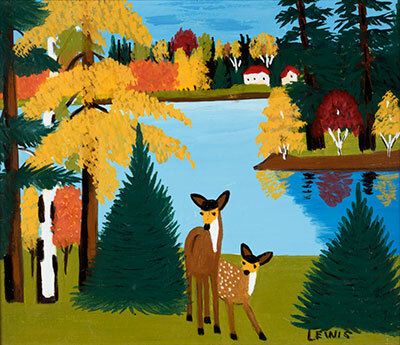 The Maud Lewis Collection line of products allows the Art Gallery of Nova Scotia to support initiatives at the Gallery that promote and inform the legacy of Maud Lewis. Visit us at our online shop for more information about these amazing products. In April 2017 Mongrel Media will release Maudie opening in select theatres across Canada.